Greatness Travel is our travel portal which will allow you to book travel to our retreats or book travel around the world in class or if you are on a budget . I am destination booking travel agent for trips to Africa. I have traveled to south Africa, Where i support a children day care center in Soweto South Africa. I have visited west Africa, Ghana where I am supporting an orphanage, I travel to Kenya and I plan to visit Uganda Africa next year to support an orphanage that work with children who parents have died of aids. I am a destination travel agent to Africa. 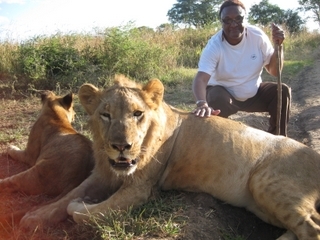 This is a picture of me touching a lion when I traveled to Victoria Falls, 2009 in Zimbawei, South Africa. I went to visit my ancestral lineage of the “Watusi African tribe”.